These days, coffee machines come in all shapes and configurations, but perhaps one of the most interesting models is the $139 Ninja Coffee Brewer CF020. No, this isn’t the model that Sofia Vergara swoons over in the Ninja Coffee commercials, but it does offer quite a few design features that make it worth a look. While you clearly know that the Ninja Coffee CF020 is a coffee maker, its design is a bit of a departure from conventional machines. First off, it’s a little wider, as it accommodates for the controls and water reservoir on one side, and the filter, carafe, and heating tray on the other. This brings the unit’s measurements in at about 15 inches tall, 10.5 inches wide, and 11.65 inches deep. While it’s a little bigger than the average machine, it doesn’t take up too much space on a counter and can easily fit under a standard cabinet. Maybe this is silly, but we can always tell how easy a coffee machine is going to be to use when programming the time. If that function is intuitive, then chances are good everything else will be, too. That’s certainly the case with Ninja Coffee CF020. From the minute we took it out of the box, we could tell we wouldn’t need to pop open the manual (of course, we read the manual – wouldn’t want to miss any hidden features). Case in point, once you plug in the machine, you just use the M (minutes) and H (hour) buttons to set the clock. You also use these buttons to set a delay-brew time, so your coffee is waiting for you in the morning. If you like strong coffee, you should follow the guide on the scoop. Setting the clock wasn’t the only clue that this machine would be easy to use. Unlike other coffee makers where you need to fill the pot with water and pour it into the machine, this one comes with a removable plastic water reservoir with lines on the side instructing you how high to fill it based on the amount of coffee you want to make. Simply remove the reservoir, fill it up with water, and place it back on its mount. The real design star here is the Ninja’s ability to brew quantities of coffee specifically for a cup (9.5 ounces), travel mug (14 ounces), half carafe (19 ounces), or full carafe (39 ounces). Behind the placement of the carafe is a drop-down multi-serve cup platform. Pull it down and place a mug or travel mug (if a smaller size) on it, select the corresponding button on the control pad, and the machine will dispense the right amount. This handy feature is all due to the system’s Auto-iQ, which is programmed to provide the right amount of water for size and brew type. The real benefit of this design is that you can make a single serving of coffee without using a pod. Other thoughtful features include a drip stop function that lets you turn off the drip — A super helpful detail for all of us impatient people who don’t want to wait for the brewing to be complete to pour that first cup of Joe. A no-spill lid on the carafe works like a dream and is easy to secure into place. Also on hand is a removable brew basket, so you can easily clean out those extra grinds that sometimes remain. A handy coffee scoop has visible directions on it for how many scoops you need to include to make the desired amount of coffee. Unfortunately, we found that we needed to scale this number way back or else our java was way too strong. That said, if you like strong coffee, you should follow the guide on the scoop – you won’t be disappointed. In addition to the variety of coffee sizes you can make, you can also select the type of brew you’d like. There are three options: classic brew, rich brew, and over-ice brew. Even after testing the unit for three months, we’re hard pressed to describe the difference between the classic and rich brews. On the one hand, the classic brew coffee was lighter. In fact, on some occasions it was so light that the drink tasted more like flavored water than coffee. That said, there were times when the classic brew made strong coffee. We should note that we always used the included scoop to measure out the grounds. The rich brew did typically make a stronger cup of coffee that, as the Ninja’s quick guide pamphlets states, “really stands up to milk, cream, or flavoring.” Still, there were times when the coffee was weak and others when we found grounds in the cup. The inconsistency in performance eventually became an issue for us, as we never really knew what we were going to get. The last thing we wanted to deal with first thing in the morning was a guessing game on what the coffee would taste like today. On some occasions the brew was so light, it tasted more like flavored water than coffee. We didn’t encounter flavor issues with the over ice brew option, but to be fair we didn’t make it daily. Perhaps these issues could have been mitigated if we cleaned the machine, but the clean light never went on alerting us to do so, and we encountered these issues during the first week of use. If you’re in search of a model that makes great coffee every time, consider the Behmor Brewer and skip the version with the app to save some dough. For those who really just want to make a single cup every morning, there’s always an espresso maker like the De’Longhi EC680. Sure you’ll be getting a stronger cup of coffee, but you can always use the built-in steamer to add some frothy milk and you’ll get consistent performance. Coffee taste and consistency aside, the main convenience with this machine is that it can brew a variety of sizes. One concern for us, though, was that when we pressed the full carafe button, it never got that full. Speaking of the carafe, it’s a good thing it’s dishwasher safe, otherwise it would be impossible to clean, as you can’t fit your hand through the top of the pot. You would need a dish wand to clean it by hand. One of the other benefits of this machine is that it does brew coffee quick – even if you don’t set the time for a delay brew. Read: You never have to wait long for your morning cup of Joe. The longest time it took to make coffee was 7 minutes and 23 seconds for a full carafe. The half carafe is a bit quicker, coming in with a time of 4 minutes and 53 seconds. Making a travel mug portion takes close to the same amount of time at 4 minutes and 48 seconds. The quickest way to the first morning cup is a single serving, which only took three minutes and 27 seconds. The liquid was consistently hot with a temperature reading of 158 degrees Fahrenheit, just shy of the recommended 160 degrees. That said, taking that first sip was never too hot. The Ninja Coffee Brewer CF020 comes with a one-year limited warranty. If the unit fails to operate properly under normal conditions within that time, you can send it back to the company. If the company determines the unit is defective, they will repair or replace it. 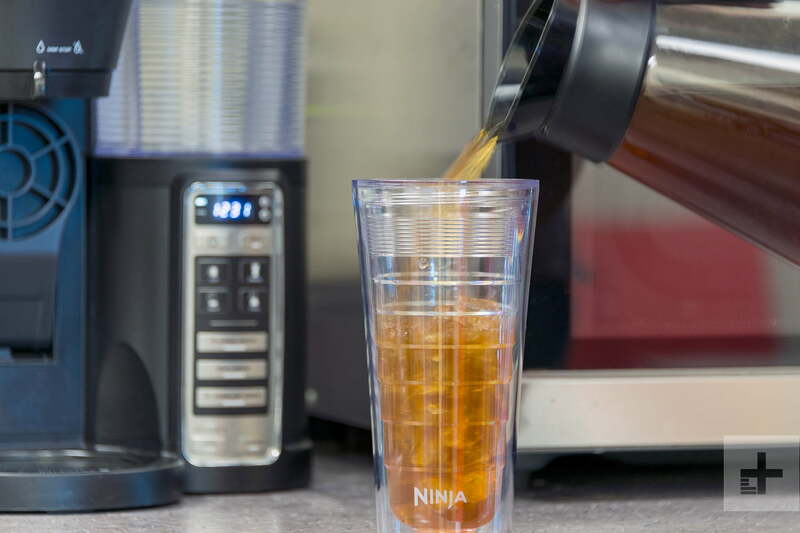 There’s a lot to like about the Ninja Coffee Brewer CF020. The intuitive and thoughtful design makes it stand out in the crowded coffee machine market. Our biggest quibble is with performance. Despite trying a variety of coffee brands during our three-month test period and trying different settings, we were never really sure how it was going to taste. One thing is certain, the brew always tended to be on the stronger side. If you really like strong coffee, this machine might be the perfect choice. There aren’t a lot of options that let you decide the range of liquid sizes every time you make coffee. There are, of course, the models that let you make a pot of coffee or an espresso, such as the De’Longhi BC0330T, for about $40 more. Others let you make a pot of coffee or a travel mug serving such as the Hamilton 2-Way Brewer and costs considerably less. Product longevity varies among coffee machines, but this unit should last at least five years. Any issues you might have with the unit will likely arise in the first few months while it’s still under warranty. At $139, the Ninja isn’t over-priced for what it does. However, in the end it really depends on the type of coffee you like to make and if you need the flexibility of serving sizes. If you’re someone who has been in search of a single-cup coffee option that doesn’t require the use of a pod, you’d be hard-pressed to find a better alternative.